CEASE, Sir SAMUEL, gallant Sailor! Be thy Patriot voice unknown ! All the Snips had heard before ! Cotton Draw'rs for ALI KHAN ! Of the man I now IMPEACH ! Knew the Secrets of the State ? I presented to the HOUSE ? BURDETT, JONES, and Parson HORNE. Speedily sewn up by me ! Mount me cross-legg'd on the throne. If there be one---vote for me! But are just as fit as I. This ballad appears to be a parody concerning the Scottish politician James Paull. 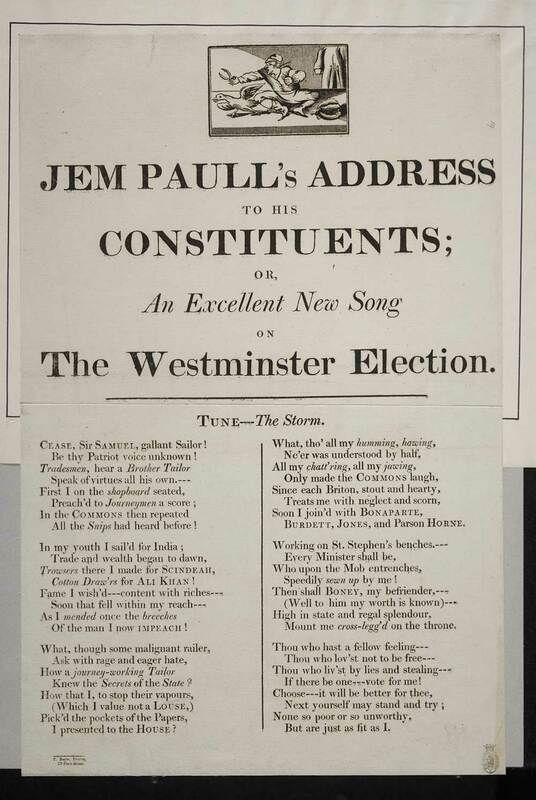 He purchased a seat in the 1805 election and this ballad is likely to have been an attempt to discredit him in the campaigning for the 1806 election, hence the mention of his conections with other radical politicians (e.g. Sir Francis Burdett). First line reads: Cease, Sir Samuel, gallant Sailor! Tune: - The storm.